Imagine stalking a Massive Rocky Mountain Elk within 35 to 50 yards on a cool morning within the heavily wooded and rolling hills of the Ozark Mountains in Missouri while you hear bugling in the far distance over the ridge on a bow hunt. Most hunters don’t realize just how big the Elk are until they see them live for the first time. 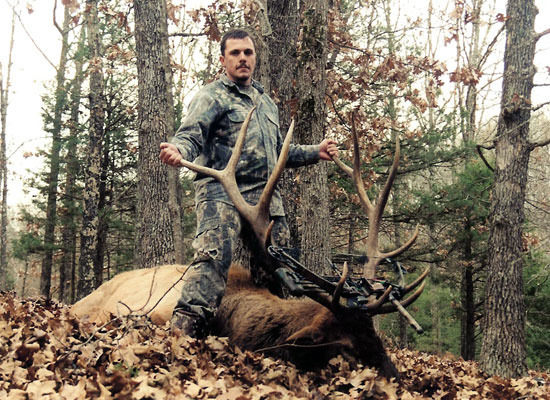 To be successful at archery Elk hunting you need to be a good shot. You also need to understand the animal; where they walk, where they like to feed, where they drink and their habits. This is where our very experienced guides come in to assist you in getting that close shot. With many years of guiding knowledge and animal behavioral understanding helps increase your success rate. We have over 30 plus years of experience providing bow hunters a high success rate to take home a trophy of a lifetime and excellent table fare. There is definitely nothing more exhilarating than a bow hunt at High Adventure Ranch!